I got eight and a half hours of sleep last night AND Jonah has slept all night the last three nights. WOOHOO! I was getting worried because the previous two nights had been bad and he had woken up for one to two hours and just screamed. We rocked him back to sleep, but then he'd wake up and cry every time we put him down... So, I was afraid he was deciding he was all done with the all night sleeping. Shwoo. That was a close one. Hi friends. Today we changed diapers, watched Blues Clues, tried some solids, ate a bottle, did bath, did dressing change, ate another bottle, took a nap while being held, played in the floor, played in the exersaucer, watched Gabba and/or Sesame Street, played with our cars, read some books, played in the high chair, tried more solids, ate another bottle, maybe took another nap, played with our ball popper, played with our basketball goal, took meds, popped blisters, aquaphored our face, and went to bed. Mom and Shaina babysat Jonah last night so Matt and I went to Sagebrush. A while back I signed up with Coupon Mom and got a code for $25 restaurant gift certificates for only $5 (or something like that), and Sagebrush was one of the ones we had a coupon for. You had to spend at least $35 to get $25 off, so needless to say, we ate way too much. It was awesome. I do have some cute videos of Jonah I want to try to post soon, but I'm STILL trying to figure out my new camera. It takes great video but is a lot more complicated. There's dubbing and editing and the process of just getting them from memory card to computer is a lot more involved. I'm working on it though. I hope they'll be worth the wait. Anyway, I feel like his post was a whole lotta nothin' (except for the cute invitation, of course). Sorry about that. Today and tomorrow are supposed to be cold still, but Matt says it's supposed to be in the 50's Friday, Saturday, and Sunday. I think Jonah's ready for swinging at the park (we've never been), so I hope to get to go this weekend. Hope everybody has a Happy Wednesday. Awww...LOVE the invite, it's SO cute!! You'll have such fun at that b-day party for sure, what an enormous milestone for your sweet little Jonut! Love that you are taking some breaks for yourself, I so get that cause I've been trying to do the same thing! Enjoy and glad to hear you're getting some real sleep..yay for sleep! LOVE that invite!! It is way cute. I hope the weather warms up soon so you can get out of the house. I am getting a lot of cabin fever with my daughter also. Posts about a lot of nothing are great! You need some boring days in your life! He is a total doll! Love the invitation! Although I do not post often I do not miss a post.. Jonah is beyond the most handsome little boy there is. (besides my Noah, of course)I have not missed a post since the day Jonah was born, I can officially say that I am hooked. I wish I was able to blog like you do. Maybe my days are just way to boring? Or, I simply do not have the talent that you do! The invite is SOOOOO cute! Super cute invitation! Very glad to hear that he slept for you. I am a much better mommy after a good night's rest, so when in doubt always opt to go to bed. I'm excited to hear that you might be able to hit the park this weekend- another big milestone for that cute little guy. I love the invite!! Its so cute!! Jonah is the cutest kid around!! Very cute invitation! I wish my little one would sleep through the night...in her bed...I suppose it's my fault for holding her so much when she was little, but oh well, she's snuggly! Love love love the invitation. It is so cute.Great pic of Jonah. Don't worry about blogging everyday we will be fine,you try to get rest and enjoy Jonah. Glad Jonah has slept and you got some rest. Love working with you on these - he makes me smile!! hugs! Loved the invitation! Jonah is so precious. So glad to hear you are getting some much needed rest. Much like yourself I am ready for the warmer weather to work its way to our area so we can go outside. This has been the coldest, wettest winter I can remember. Glad to hear you are both getting some sleep. I know right now having to hold him for short naps can seem frustrating at times, especially if you have things that need to be done. One day you will look back and be thankful for all the snuggle time! Don't worry about blogging...do what you need to do for you and your family. We love you and understand and will be patiently waiting! Hope he loves swinging!! I forgot to mention...another previous post comment. I know panera has awesome broccoli soup but, have you ever tried the broccoli soup from Applebee's? I'm envying the 8.5 hours of sleep thing - I don't think I even got that much before I had kids! Enjoy the rest! 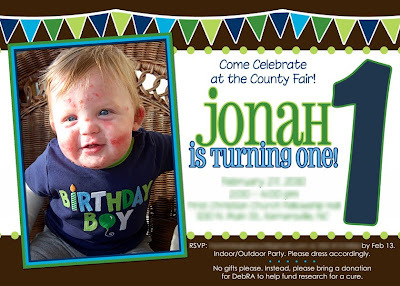 Your invite is adorable just like Jonah. Your family is your priority and that is where your time belongs, and hopefiully in there you take time to rest and rejuvenate yourself and if this doesn't include blogging that is fine. You, Matt and Jonah stay in our prayers. I haven't been aroung much either as my husband's cancer has returned and he's had surgery twice in the last 5 days. Once for cancer and once for a foot infection exasperated by the cancer. I featured Jonah and the EB fundraiser on my blog today. Hope I did ok. Happy Birthday, Jonut!!!! So cute!! I love Jonah's shirt. Stepping back from daily blogging sounds like a good move for you--I'm lucky if I put up a blog post every week, so you are already way ahead of me! I hope you make it to the swings soon. Awww, he is so stinkin' adorable! I love the invitation! Someday I would love to meet you and to see your sweet little man, but for now I'm happy with as much blogging as you want to do. I just took a week off from my blog, and felt guilty about it but it's good to take care of yourself first! I love the invites! Of course anything with baby Jonah on the front has to be cute! I totally get the being stuck in the house day after day. I have a 21 month old and twin 4 month olds, so suffice to say, we don't get out much. It will drive you INSANE as you know! I'm so glad Jonah is sleeping again. Getting enough sleep seems to make everything else seem at least a little better. Will continue to pray for those two hour crib naps! LOVE the invite! He is so precious! Can't believe he is turning ONE! Glad nothing is going on. At work today had newborn born with I think will be EB. Too early to tell but infant went to NICU. Feeling for the parents what a shock to not have that healthy baby they had hoped for. Pray for you all. He is ADORABLE! Just want to kiss him all over and I don't even know you or him! Funny, right? This internet thing really is a crazy world. Happy birthday to Jonah! Don't worry about the blogging. We all know what you're doing as a mom to a one year old. When he starts talking, your days will definitely get more interesting! Love the invitation! You picked my favorite picture too!! Oh yeah, I'm definitely up for the "let's meet the locals"! Can't believe your little Jonah is already turning 1 . . . time flies . . . fun or not, it flies.